Kiribati ([kɪribas]  or [ˌkɪrəˈbɑti]; Gilbertese: ), officially the Independent and Sovereign Republic of Kiribati, is an island nation in the central tropical Pacific Ocean. The permanent population is just over 100,000 (2011) on . The nation is composed of 32 atolls and one raised coral island, Banaba, dispersed over 3.5 million square kilometres, (1,351,000 square miles) straddling the equator, and bordering the International Date Line at its easternmost point amidst the Line Islands. Kiribati was named in French by captains Krusenstern and Louis Isidore Duperrey "îles Gilbert", Gilbert Islands, after the British Captain Thomas Gilbert, who sighted the islands in 1788. 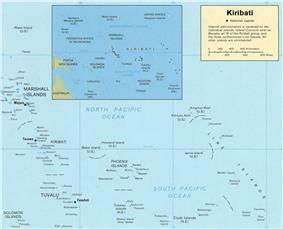 The current name, Kiribati, is an adaptation of "Gilberts", from the former European name the "Gilbert Islands". Although the indigenous name for the Gilbert Islands proper is Tungaru in Gilbertese language, the new state chose the name Kiribati, the Gilbertese rendition of Gilberts, as an equivalent of the former colony to acknowledge the inclusion of islands never considered part of the Gilberts chain. Contact with Europeans began in the 16th century when Magellan, Saavedra and Quirós discovered and conquered the islands of Pope Clement VIII in 1520, the islands of Queen Catalina in 1528 and the Island (La) Carolina in 1606. Spanish rule lasted from 1528-1885 during which time the islands of Santa Catalina were named in honor of Queen Catherine of Aragon. Whalers, slave traders and merchant ships arrived in large numbers during the 19th century leading to conflicts between the islanders and the introduction European diseases. From the early 19th century, western whalers, merchant vessels and slave traders visited the islands, introducing diseases and firearms. The first British settlers arrived in 1837. In 1892 the Gilbert Islands consented to become a British protectorate together with the nearby Ellice Islands. They were administered by the Western Pacific High Commission based in Fiji. Together they became the crown colony of the Gilbert and Ellice Islands in 1916. Christmas Island (or Kiritimati) became part of the colony in 1919 and the Phoenix Islands were added in 1937. Sir Arthur Grimble was a cadet administrative officer based at Tarawa (1913–1919) and became Resident Commissioner of the Gilbert and Ellice Islands colony in 1926. In 1902, the Pacific Cable Board laid the first trans-Pacific telegraph cable from Victoria, British Columbia to Fanning Island (Tabuaeran) in the Line Islands and from Fiji to Fanning Island, thus completing the All Red Line, a series of telegraph lines circumnavigating the globe completely within the British Empire. The location of Fanning Island, one of the closest formations to Hawaii, led to its annexation by the British Empire in 1888. Nearby candidates including Palmyra Island were disfavored due to the lack of adequate landing sites. The US eventually incorporated the Northern Line and other islands which lie between Kiriribati and the Line Islands, including Howland, Jarvis, and Baker islands. The Gilbert and Ellice Islands gained self-rule in 1971, and were separated in 1975 and granted internal self-government by Britain. In 1978 the Ellice Islands became the independent nation of Tuvalu. The Gilbert Islands became independent as Kiribati on 12 July 1979. Although the indigenous Gilbertese language name for the Gilbert Islands proper is "Tungaru", the new state chose the name "Kiribati", the Gilbertese rendition of "Gilberts", as an equivalent of the former colony to acknowledge the inclusion of Banaba, the Line Islands, and the Phoenix Islands, which were never considered part of the Gilberts chain. 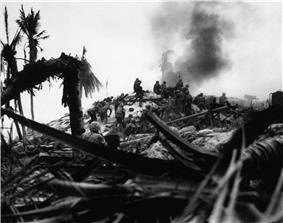 In the Treaty of Tarawa, signed shortly after independence and ratified in 1983, the United States relinquished all claims to the sparsely inhabited Phoenix Islands and those of the Line Islands that are part of Kiribati territory. Overcrowding has been a problem. In 1988 it was announced that 4,700 residents of the main island group would be resettled onto less-populated islands. Teburoro Tito was elected president in 1994. Kiribati's 1995 act of moving the international date line far to the east to encompass the Line Islands group, so that it would no longer be divided by the date line, courted controversy. The move, which fulfilled one of President Tito's campaign promises, was intended to allow businesses all across the expansive nation to keep the same business week. This also enabled Kiribati to become the first country to see the dawn of the third millennium, an event of significance for tourism. Tito was re-elected in 1998. Kiribati gained UN membership in 1999. In 2002 Kiribati passed a controversial law enabling the government to shut down newspapers. The legislation followed the launching of Kiribati's first successful non-government-run newspaper. President Tito was re-elected in 2003, but was removed from office in March 2003 by a no-confidence vote and replaced by a Council of State. Anote Tong of the opposition party Boutokaan Te Koaua was elected to succeed Tito in July 2003. He was re-elected in 2007. In June 2008, Kiribati officials asked Australia and New Zealand to accept Kiribati citizens as permanent refugees. 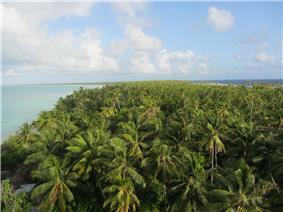 Kiribati is expected to be the first country to lose all its land territory to global climate change. In June 2008, the Kiribati president Anote Tong said that the country has reached "...the point of no return." He added, "To plan for the day when you no longer have a country is indeed painful but I think we have to do that." In early 2012, the government of Kiribati purchased the 2,200-hectare Natoavatu Estate on the second largest island of Fiji, Vanua Levu. At the time it was widely, but incorrectly, reported that the Government planned to evacuate the entire population of Kiribati to Fiji. However, in April 2013, President Tong began urging citizens to evacuate the islands and migrate elsewhere. The Kiribati Constitution, promulgated 12 July 1979, provides for free and open elections. The executive branch consists of a president (te Beretitenti), a vice-president and a cabinet (the president is also chief of the cabinet and must be an MP). The constitution requires that the president be nominated from among elected legislators, and limits the office to three four-year terms. The cabinet is composed of the president, vice-president, and 10 ministers (appointed by the president) who are members of the House of Assembly. Law enforcement in Kiribati is carried out by the Kiribati Police Service which is responsible for all law enforcement and paramilitary duties for the island nation. There are police posts located on all of the islands. The police have one patrol boat. 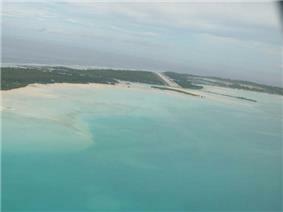 However Kiribati has no military and relies on both Australia and New Zealand for its defense. Phoenix Islands, the second largest protected marine reserve in the world since the establishment of the Chagos Archipelago as a marine reserve. Four of the former districts (including Tarawa) lie in the Gilbert Islands, where most of the country's population lives. Five of the Line Islands are uninhabited (Malden Island, Starbuck Island, Caroline Island, Vostok Island and Flint Island). The Phoenix Islands are uninhabited except for Kanton, and have no representation. Banaba itself is sparsely inhabited now. There is also a non-elected representative of the Banabans on Rabi Island in Fiji. Each of the 21 inhabited islands has a local council that takes care of the daily affairs. Tarawa Atoll has three councils: Betio Town Council, Te Inainano Urban Council (for the rest of South Tarawa) and Eutan Tarawa Council (for North Tarawa). Kiribati was admitted as the 186th member of the United Nations in September 1999. Kiribati maintains relations with its Pacific neighbours, Japan, Australia and New Zealand, which provide the majority of the country's foreign aid. Taiwan and Japan also have specified-period licences to fish in Kiribati's waters. In November 1999 it was announced that Japan's National Space Development Agency planned to lease land on Kiritimati (Christmas Island) for 20 years, on which to build a spaceport. The agreement stipulated that Japan was to pay US$840,000 per year and would also pay for any damage to roads and the environment. A Japanese-built downrange tracking station operates on Kiritimati and an abandoned airfield on the island was designated as the landing strip for a proposed reusable unmanned space shuttle called HOPE-X. HOPE-X, however, was eventually cancelled by Japan in 2003. As one of the world's most vulnerable nations to the effects of climate change, Kiribati has been an active participant in international diplomatic efforts relating to climate change, most importantly the Small Island Developing States (SIDS) to address global warming. AOSIS has been very active from its inception, putting forward the first draft text in the Kyoto Protocol negotiations as early as 1994. In 2013, President Tong has spoken of climate-change induced sea level rise as "inevitable". "For our people to survive, then they will have to migrate. Either we can wait for the time when we have to move people en masse or we can prepare them—beginning from now ..." In New York in 2014, per The New Yorker, President Tong told The New York Times that "according to the projections, within this century, the water will be higher than the highest point in our lands". Banaba (or Ocean Island) is a raised-coral island. It was once a rich source of phosphates, but was mostly mined out before independence. The rest of the land in Kiribati consists of the sand and reef rock islets of atolls or coral islands, which rise only one or two metres above sea level. Thomas, Frank R. (2003). "Kiribati: 'Some aspects of human ecology,' forty years later". 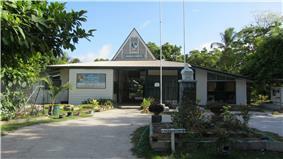 Atoll Research Bulletin (Natural Museum of Natural History Smithsonian Institution) 501: 1–40. ^ "Kiribati government website". Government of Kiribati. Retrieved 2014-05-29. ^ a b c d "Kiribati". International Monetary Fund. Retrieved 19 April 2012. ^ "kiribati – Definition from the Merriam-Webster Online Dictionary". M-w.com. 25 April 2007. Retrieved 14 May 2010. ^ New Oxford American Dictionary 3rd edition, 2010, Oxford University Press, Inc.
^ Both maps, published in 1820, were written in French. In English, the archipelago was named Kingsmill during most of the 19th century. The name began to change to Gilberts only in 1892. ^ Sabatier, Ernest. Dictionnaire gilbertin-français Tabuiroa, 1954 says that "Kiribati" is already the meaning for all the Gilberts District of GEIC. ^ Reilly Ridgell. Pacific Nations and Territories: The Islands of Micronesia, Melanesia, and Polynesia. 3rd Edition. Honolulu: Bess Press, 1995. ISBN 1573060011 p. 95. ^ a b "BBC Timeline:Kiribati". BBC. 15 May 2008. Retrieved 29 July 2008. ^ a b Grimble, Sir Arthur (1952). A Pattern of Islands. ^ Reilly Ridgell. "Pacific Nations and Territories: The Islands of Micronesia, Melanesia, and Polynesia". 3rd Edition. Honolulu: Bess Press, 1995. p. 95. ^ "Kiribati". Un.org. 1 October 2003. Retrieved 14 May 2010. ^ Chapman, Paul (7 March 2012). "Entire nation of Kiribati to be relocated over rising sea level threat". The Daily Telegraph (London). ^ Spektor, Dina (7 March 2012) Rising Sea Levels Threaten South Pacific Nation Of Kiribati. Business Insider. Retrieved on 2 March 2013. 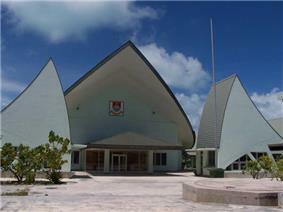 ^ "Kiribati parliament to consider Fiji land purchase". Radio NZ (Wellington). 11 April 2012. ^ Russell, Christine (February 2009). "First Wave". Science News 175 (5): 25–29. ^ Government of Kiribati announces the Tarawa Climate Change Conference. climate.gov.ki, 12 November 2010. ^ Webb, A.P. ; Kench, P.S. (2010). "The dynamic response of reef islands to sea-level rise: Evidence from multi-decadal analysis of island change in the Central Pacific". Global and Planetary Change (Elsevier). ^ Sovereign Wealth Fund Institute. Swfinstitute.org. Retrieved on 2 March 2013. ^ "2010 Kiribati census, Table 6". Government of Kiribati. Retrieved June 15, 2013. ^ Kiribiati. Country Profile, WHO. ^ Lopresti, Mike (19 August 2004). "Small step at Olympics is giant leap for tiny island nation". ^ Johnston, Neil (30 July 2014). "Glasgow 2014: David Katoatau claims first ever Kiribati medal". ^ Djazmi, Mani (20 April 2012). "The hardest job in football?". Edwardo Carlyon Eliot, who was Resident Commissioner of the Gilbert & Ellice Islands (now Kiribati & Tuvalu) from 1913 to 1920 describes this period in his book "Broken Atoms" (autobiographical reminiscences) Pub. G. Bles, London, 1938. The Kiribati national football team is an associate member of the Oceania Football Confederation, but not of world-governing body FIFA. It has played ten matches, all of which it has lost, and all at the Pacific Games from 1979 to 2011. 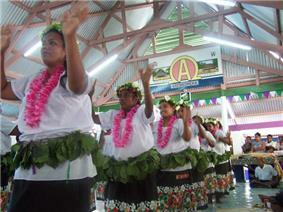 Kiribati folk music is generally based on chanting or other forms of vocalising, accompanied by body percussion. Public performances in modern Kiribati are generally performed by a seated chorus, accompanied by a guitar. However, during formal performances of the standing dance (Te Kaimatoa) or the hip dance (Te Buki), a wooden box is used as a percussion instrument. This box is constructed to give a hollow and reverberating tone when struck simultaneously by a chorus of men sitting around it. Traditional songs are often love-themed, but there are also competitive, religious, children's, patriotic, war and wedding songs . There are also stick dances which accompany legends and semi-historical stories . These stick dances or "tirere" (pronounced seerere) are performed only during major festivals. 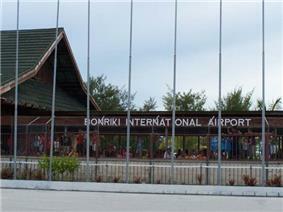 Internationally, Our Airline, the national airline of Nauru, also provides a weekly service on behalf of Air Kiribati from Tarawa to Nadi International Airport, as well as a service to Nauru International Airport, connecting to Honiara, the capital of the Solomon Islands, and further to Brisbane, Australia. Neither the Phoenix nor Line Islands are served by the domestic carriers. Fiji's national carrier Fiji Airways provides an international service to Cassidy International Airport on Kiritimati from Fiji's main airport, Nadi International Airport. Primary education is free and compulsory for the first six years, now being extended to nine years. Mission schools are slowly being absorbed into the government primary school system. Higher education is expanding; students may seek technical, teacher or marine training, or study in other countries. To date, most choosing to do the latter have gone to Fiji, and those wishing to complete medical training have been sent to Cuba. Most health problems are related to consumption of semi-raw seafood, limited amount of food storage facilities, and bacterial contamination of fresh water supplies. In the early 2000s, between 1 and 7% of the population, depending on the island, were annually treated for food poisoning in a hospital. Modernization and cross-cultural exchange of the late 1900s brought new issues of unhealthy diet and lifestyle; heavy smoking, especially among the young population; and external infections, including HIV/AIDS. The population of Kiribati has a life expectancy at birth of 60 years (57 for males, and 63 for females) and an infant mortality rate of 54 deaths per 1,000 live births. Tuberculosis is present in the country. Government expenditure on health was at US$268 per capita (PPP) in 2006. In 1990–2007, there were 23 physicians per 100,000 persons. Since the arrival of Cuban doctors, the infant mortality rate has decreased significantly. The Kiribati Census in 2010 enumerated the population at 103,058. The vast majority (>90%) of people inhabit the Gilbert Islands, with more than 33% populating an area of about 16 km2 (6.2 sq mi) on South Tarawa. Until recently, the people of Kiribati mostly lived in villages with populations between 50 and 3,000 on the outer islands. Most houses are made of materials obtained from coconut and pandanus trees. Frequent droughts and infertile soil hinder reliable large-scale agriculture, so the islanders have largely turned to the sea for livelihood and subsistence. Most are outrigger sailors and fishermen. Copra plantations serve as a second source of employment. However, in recent years large numbers of citizens have moved to the more urban island capital of Tarawa; increasing urbanisation has raised the population of South Tarawa to 50,182. Christianity is the major religion, having been introduced by missionaries in the 19th century. The population is predominantly Roman Catholic (56%), although a substantial portion of the population is Congregationalist Protestant (34%). Many other Protestant denominations, including more evangelical types, are also represented. The Bahá'í Faith religion also exists in Kiribati (2.2%), along with Jehovah's Witnesses and The Church of Jesus Christ of Latter-day Saints (LDS Church) (4.7%). The Church of Jesus Christ of Latter-day Saints self-reports a membership of 15,364 (14.6%) at the end of 2011. The people of Kiribati speak an Oceanic language called "Gilbertese". 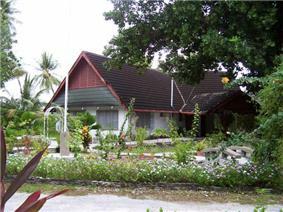 Although English is also an official language, it is not used very often outside the island capital of Tarawa. It is more likely that English is mixed in its use with Gilbertese. Older generations of I-Kiribati tend to use more complicated versions of the language. Ethnically, the I-Kiribati are Micronesians. Recent archaeological evidence indicates that Austronesians originally settled the islands thousands of years ago. Around the 14th century, Fijians, Samoans, and Tongans invaded the islands, thus diversifying the ethnic range and introducing Polynesian linguistic traits. Intermarriage among all ancestral groups, however, has led to a population reasonably homogeneous in appearance and traditions. The native people of Kiribati are called I-Kiribati. The major donors in 2010/2011 were Australia (A$15 million), Taiwan (A$11 million); New Zealand (A$6 million), the World Bank (A$4 million), and the Asian Development Bank. Kiribati is one of the world's poorest countries. It has few natural resources. Commercially viable phosphate deposits on Banaba were exhausted at the time of independence. Copra and fish now represent the bulk of production and exports. Kiribati is considered one of the least developed countries in the world. 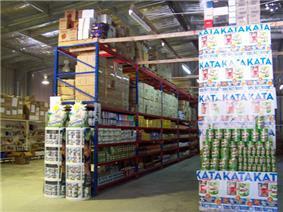 In one form or another, Kiribati gets a large portion of its income from abroad. Examples include fishing licenses, development assistance, worker remittances, and tourism. Given Kiribati's limited domestic production ability, it must import nearly all of its essential foodstuffs and manufactured items; it depends on these external sources of income for financing. 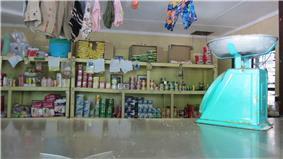 Goods in a store on the outer islands. Because of the young geological age of the islands and atolls and high level of soil salination the flora of Kiribati is relatively poor. It contains about 83 indigenous and 306 introduced plants on Gilbert Islands, whereas the corresponding numbers for Line and Phoenix Islands are 67 and 283. None of these species are endemic, and about half of the indigenous ones have a limited distribution and became endangered or nearly extinct due to human activities such as phosphate mining. Coconut and pandanus palms and breadfruit trees are most common wild plants, whereas the five most cultivated crops are Chinese cabbage, pumpkin, tomato, watermelon and cucumber. 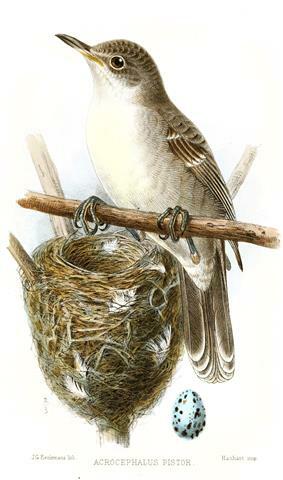 The Bokikokiko (‘’Acrocephalus aequinoctialis’’) is the only land wildlife species endemic to Kiribati. The climate is pleasant from April to October, with predominant northeastern winds and stable temperatures close to 30 °C (86 °F). From November to March, western gales bring rain and occasional hurricanes. The Kiribati Adaptation Program (KAP) is a US $5.5 million initiative that was originally enacted by the national government of Kiribati with the support of the Global Environment Facility (GEF), the World Bank, the United Nations Development Program, and the Japanese government. Australia later joined the coalition, donating US $1.5 million to the effort. The program aims to take place over six years, supporting measures that reduce Kiribati's vulnerability to the effects of climate change and sea level rise by raising awareness of climate change, assessing and protecting available water resources, and managing inundation. At the start of the Adaptation Program, representatives from each of the inhabited atolls identified key climatic changes that had taken place over the past 20–40 years and proposed coping mechanisms to deal with these changes under four categories of urgency of need. The program is now focusing on the country's most vulnerable sectors in the most highly populated areas. Initiatives include improving water supply management in and around Tarawa; coastal management protection measures such as mangrove re-plantation and protection of public infrastructure; strengthening laws to reduce coastal erosion; and population settlement planning to reduce personal risks. However, sea-level rise may not necessarily inundate Kiribati. Paul Kench at the University of Auckland in New Zealand and Arthur Webb at the South Pacific Applied Geoscience Commission in Fiji released a study in 2010 on the dynamic response of reef islands to sea level rise in the central Pacific. Kiribati was mentioned in the study, and Webb and Kench found that the three major urbanised islands in Kiribati—Betio, Bairiki and Nanikai—increased by 30% (36 hectares), 16.3% (5.8 hectares) and 12.5% (0.8 hectares), respectively. According to the Pacific Regional Environment Programme (previously South Pacific Regional Environment Programme (SPREP)), two small uninhabited Kiribati islets, Tebua Tarawa and Abanuea, disappeared underwater in 1999. The United Nations Intergovernmental Panel on Climate Change predicts that sea levels will rise by about 50 cm (20 in) by 2100 due to global warming and a further rise would be inevitable. It is thus likely that within a century the nation's arable land will become subject to increased soil salination and will be largely submerged. Kiritimati (Christmas Island) in the Line Islands is the world's largest atoll. Based on a 1995 realignment of the International Date Line, the Line Islands are the first area to enter into a new year, including year 2000. For that reason, Caroline Island has been renamed Millennium Island. The majority of Kiribati, including the capital, is not first, for example New Zealand (UTC+13 in January) has an earlier new year.